I don’t know about you but when I think of Italian villages I imagine picturesque hamlets of cobbled streets and crumbling brickwork, punctuated by church spires and little old ladies dressed in black hanging out their washing. I imagine old men sitting outside their houses in the narrow streets on fold down chairs, playing cards, smoking cigarettes and arguing loudly as they gesticulate like mad. This is exactly what I stumbled upon the first time I visited Stilo. 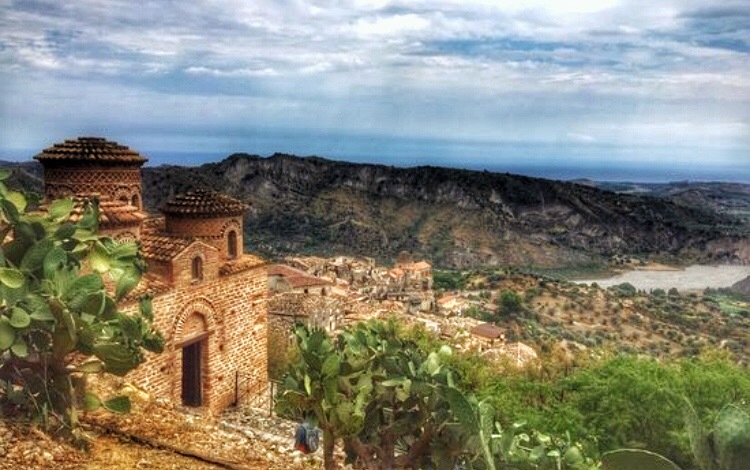 As you wander around this Byzantine village, nestled on Mount Consolino with views which stretch out over the Ionian sea, you can’t help but find yourself reaching for your camera again and again. It’s picture book perfect and yet, like most places in Calabria, you won’t find hordes of tourists or photos being ruined by an over-zealous tour guide’s umbrella thrust in the air like in Italy’s othermajor tourist attractions. All you will find here is a peaceful village with real people going about their daily routines. Narrow lanes twist and turn and the colours of the buildings set against the blue ionian sea and the bright colours of mediterranean flowers, make this gorgeous village well worth the visit. The great Italian philosopher Tomasso Campanella, most famous for his Utopian La città del sole lived here and, perched on a plastic table and chairs sipping strong espresso whilst listening to the bar owner argue with his teenage daughter about what time she has to be home tonight, I feel like I have found my Calabrese utopia! The real attraction in Stilo, other than its charming glimpse of village life, is the 10th Century Byzantine Basilica, La Cattolica di Stilo. It sits above Stilo and offers stunning views inside and out. There are beautifully well preserved medieval frescoes inside and four antique mis-matched columns which support the main dome. It is a real treat for fans of Byzantine architecture and beautiful views alike. Make sure you add Stilo to your list of places to visit, it’s a wonderful part of the world to watch the world go by and dream about the past. The pictures up there are mesmerizing. Loved the topic photograph, and the one of “La Cattolica di Stilo,” I admire your photography talent.